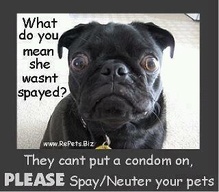 Cats and dogs can't make their own birth control decisions but YOU can. Did you know that cats and dogs can have up to two litters per year? Then their offspring have offspring and so on and so on. Stop the cycle and sponsor a neuter as a gift to your dad for Father's Day, seriously! For only $25 you can sponsor a cat neuter and for $50 a dog neuter. Instead of another tie or talking bass this will be one of the most unique gifts dad will get and it will help end the cycle of pet overpopulation. Sponsor a neuter with a donation today and we will send your dad a certificate saying lives were saved in his name! Act now and you can double your donation! A generous donor will match all donations to our SNIP SNIP (Spay Neuter Increase Program) dollar-for-dollar up to a total of $1,500! This program provides essential free or low cost spaying and neutering for pets of low-income households. By fixing one pet you can help save hundreds, if not thousands, of lives. An estimated 70,000 cats and dogs are born in the US every single day*. Unfortunately, many of these litters are unplanned and unwanted, and end up homeless, adding to the thousands who are already waiting for a home. You can help reduce this number and give already homeless cats and dogs their second chance at having a happy and healthy home by supporting our spay/neuter program. Please donate today and make a difference in the lives of cats and dogs in need and celebrate Dad at the same time.